A former football coach sexually abused a young player he befriended at a match, a court has heard. Cambridge Crown Court heard Eric Cooper, 82, offered the victim, who cannot be named for legal reasons, lifts and match tickets in the 1960s. The man said Cooper, who worked in Cambridgeshire, indecently assaulted him twice. 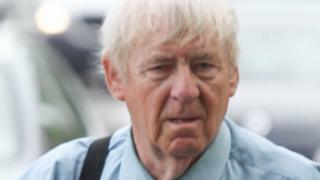 Mr Cooper, of The Shade, Soham, denies two charges of assaulting a boy under the age of 14. Michael Proctor, prosecuting, told the court the alleged victim "didn't tell anyone about these incidents for many, many years as it was a difficult and embarrassing episode that had occurred". "Eventually, years later, he plucked up the courage to disclose what happened to his partner," he added. Mr Cooper, who had played for Soham United and was also involved with Ely Crusaders, was arrested in January this year as part of a police investigation into allegations of abuse in football. When interviewed by police he "denied befriending any young players," Mr Proctor told the court. Giving evidence, Cooper's accuser said he used to grab him by the leg. "I was naive, looking back," the man said. "I never suspected anything. I thought he was just being friendly."